Don't miss this deal on a beautiful used 82' Monte Fino yacht for sale! 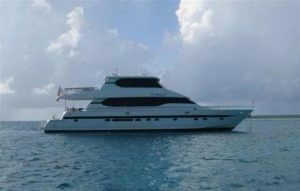 : Atlantic Yacht & Ship, Inc.
Don’t miss this deal on a beautiful used 82′ Monte Fino yacht for sale! Be sure not to miss this beautiful used 82′ Monte Fino yacht that Brad Nelson has for sale in Florida! In the first place, this lovely used 82′ Monte Fino yacht is known as “Watch Aft.” As can be seen this yacht has been expertly updated and maintained. After all she received an extensive refit in 2014. In fact, a complete paint and mechanical service was performed at that time. In a word, her three stateroom layout includes a day head. Furthermore there is crew quarters forward to make this yacht especially accommodating! In short, this used 82′ Monte Fino is a must-see for anyone looking for a turn-key 80′ – 90′ sky lounge yacht. Her twin Caterpillar 3412E diesel engines let the yacht cruise at 17 knots. Those engines have 1,350 horse power each! With a draft of only 5 feet she can safely cruise where others may not. Additionally, you have plenty of power when off the dock. That is due to the twin 25kW Onan generators. You will be extra comfortable under way due to her Naiad stabilizers as well! For more information on this beautiful used 82′ Monte Fino be sure to contact Brad Nelson today! Don’t miss this beautiful used 82′ Monte Fino yacht for sale in Florida! In the market for a beautiful pre-owned 82′ Monte Fino yacht for sale? Just listed: a beautiful used 82′ Monte Fino yacht for sale in Florida! This used 82′ Monte Fino yacht is back on the market!